The Woodlands, Texas – Multi-platinum, Grammy-nominated band Goo Goo Dolls has announced that their upcoming show at The Cynthia Woods Mitchell Pavilion will go on as scheduled next Thursday, September 7. Concertgoers are encouraged to bring non-perishable donation items to the show to help support Hurricane Harvey relief efforts. Donations will be collected at the North drop-off in front of the venue from 3 to 7:30 p.m. on the day of the show. The band, along with Phillip Phillips, will be outside from 5:30 to 6:30 p.m. to thank the Texas community for their resilience during this terrible tragedy. Per the group, all donations, along with 100% of merchandise sales for the night, will go to the Houston Food Bank. Those who are able to bring donations will receive a voucher that is good for the purchase of one $20 dollar ticket to the Goo Goo Dolls concert that can then be redeemed at The Pavilion Box Office. Those who are unable to attend the show are still encouraged to make donations. A list of the most needed donation items can be found below. 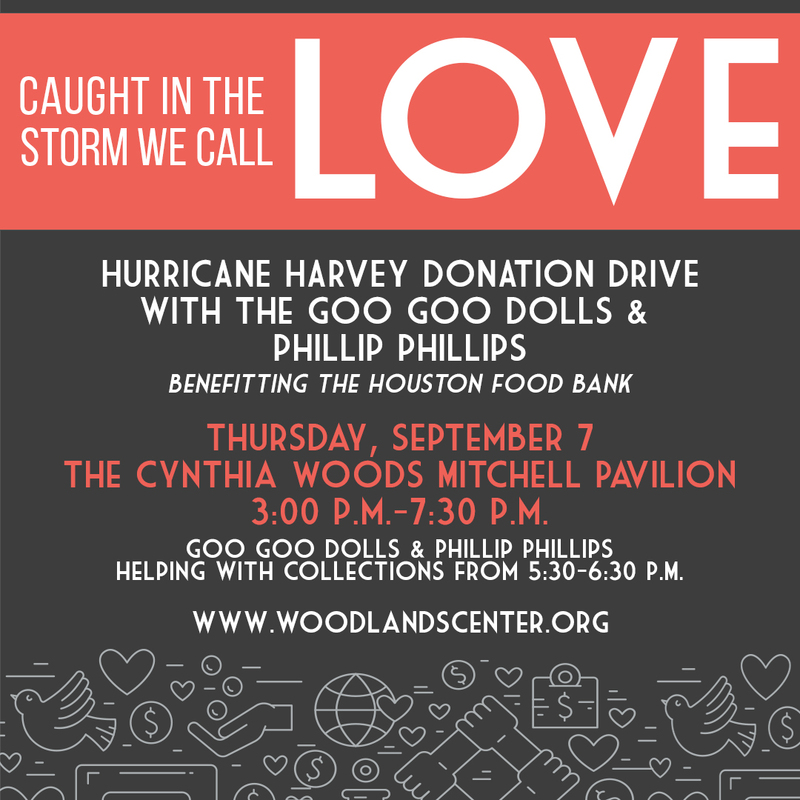 Goo Goo Dolls and The Cynthia Woods Mitchell Pavilion hope to echo Houston Mayor Sylvester Turner’s sentiment that “the city of Houston is open for business,” and provide the heroic first responders and residents of Texas with an evening of optimism and appreciation. With this in mind, The Pavilion and the band will be granting free entrance into the show for first responders and their families. Proof of ID and first responder badges must be presented at the marked entrances located at any of the venue’s 3 gates. Most Needed Donation Items Include: Canned, ready-to-eat items with pull tops (vegetables, fruit); Protein in pouches or pull-top cans (tuna, beef stew, chili, canned chicken); Peanut Butter; Snacks (granola bars, breakfast bars, etc. ); Toiletries; Paper Goods; Diapers; Cleaning Supplies (mops, mop buckets, brooms, bleach wipes, bleach, garbage bags, bug spray). Please Note: We are unable to accept baby food, clothing, household items and other items not on this list.